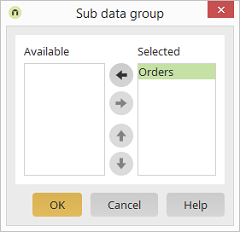 All of the selectable subordinate data groups are listed here. All of the selected subordinate data groups are listed here. The data from this data group will also be searched through by the Research element. Moves the selectable subordinate data groups from on list to the other. Adjust the order and therefore the priority of the subordinate data groups during the research. Please note that all data from the main data group and the subordinate data group will always be available for research. If you do not want to have sensitive data available in the research, please move this data to a data group that will not be queried.